Between 1614 and 1622, John Napier discovered logarithms, Edmund Gunter devised a scale on which numerals could be multiplied and divided by measuring the distance between two logarithmic numbers with a pair of dividers, and William Oughtred put two such scales alongside each other, moving one on a slide so that the distance between the numbers could be read off directly. The speed with which these developments unfolded suggests the power that logarithms provided for reducing the tedium of calculation. By the 1680s, the English used slide rules in carpentry and in gauging (estimating liquid volumes)—the instruments were quite helpful for determining excise taxes on barrels of liquor. It was not until the late eighteenth century that slide rules were commonly utilized in the manufacture of machines and machine tools, most notably by James Boulton and James Watt. Several more decades passed before slide rule use became widespread throughout Europe. French artillery officer Amedée Mannheim fostered acceptance of the rectangular or linear form of the instrument in 1851 by standardizing the general types of scales and the order in which the scales were arranged. Mannheim also developed the cursor or indicator, which made it easier to read results from two scales that were not adjacent to each other. By the 1870s, German companies made slide rules one of the first consumer products to be fashioned out of plastic (specifically, sheets of celluloid laminated to a wooden frame), and they built dividing engines that permitted mass production of the scales engraved on slide rules. 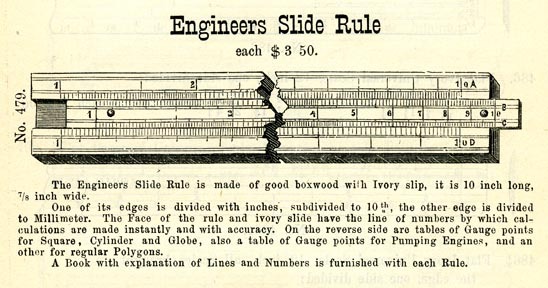 In the United States in the 1890s, Keuffel & Esser of New York City pioneered first the import and then the domestic manufacture of linear slide rules. Numerous other companies entered the market in the 20th century. The basic process for setting up and solving problems is the same for operations on other scales. If the numbers used in the calculation produce a result off the ends of the scales, a user employs the CI and DI scales, which put the number line in inverse, or reverse, order. If the numbers still extend past the end of the instrument, the user may try the "folded" CF and DF scales, which start numbering at π instead of at 1. The A and B scales are number lines of squares, so they are used with the C or D scales to square (or take the square root of) a number. The K scale provides cubes and cube roots. L scales represent common logarithms, S scales give sines and cosines, and T scales indicate tangents. This is an eight-inch, four-sided boxwood slide rule used for measuring and taxing barrels of liquid. On one end of the rule, the slides on each side have been labeled with the four Roman numerals, I, II, III, and IV. On side I, the base has logarithmic scales that run from 1 to 8 and from 8 to 100. It is labeled Seg St (Segments Standing) at the top left and SS at the bottom right. The slide has two identical C scales, logarithmically divided from 1 to 9. This side was used to estimate the volume of a barrel that was standing vertically and partially filled. The back of the slide lists calculating factors used in computing taxes on various liquors. For instance, the duty on one barrel of vinegar was equivalent to the duty on 7.56 barrels of small beer. On side II, the base has logarithmic scales that run from 0 to 4 and from 4 to 100. The bottom right corner is labeled SL (Segments Lying) for estimating the volume of a partially filled barrel lying on its side. The slide has two identical B scales, logarithmically divided from 1 to 10. The point 231 is marked W, showing the number of cubic inches in a wine gallon, and pi (314) is marked with a C. The back of the slide has a table of gauge points for converting between volumes in cubic inches and numbers of gallons for substances in square or circular containers. On side III, the base has an A scale, logarithmically divided from 1 to 10, and an MD (Malt Depth) scale that runs logarithmically in the opposite direction from somewhat less than 3 to 20. Point 2150 on the A scale is marked MB, for the number of cubic inches in a malt bushel, and point 282 is marked A, for the number of cubic inches in an ale gallon. The slide has two identical B scales, logarithmically divided from 1 to 9. The back of the slide has a scale of inches, a scale labeled Spheroid, and a scale labeled 2d Variety. These scales are for determining the diameters of two different shapes of barrels. Underneath the slide is marked: LEWIS & BRIGGS : Makers. No. 52. BOW. LANE. Cheapside. LONDON. On side IV, the base has a D scale, logarithmically divided from 1 to 3.2 and from 3.2 to 10. Point 17.15 is marked WG, for the diameter in inches of a cylinder that contains one gallon of wine when filled to a depth of one inch. Point 18.95 is marked AG for the diameter of a cylinder containing one gallon of ale. Point 46.3 is marked MS, for the side of a square vessel that contains a solid bushel per inch of depth, and point 52.32 is marked MR, for the side of a square vessel that contains a malt bushel per inch of depth. The slide has two identical C scales, logarithmically divided from 1 to 10. The back of the slide has a table of divisors for converting between volumes in cubic inches and numbers of gallons for substances in square or circular containers. The numbers in this table are squares of the gauge points in the table on the back of the slide on side II. Underneath the slide is marked: Willm. Wright : April. 30. 1795. According to Gloria Clifton, the firm of Lewis & Briggs operated in London from at least 1795 to 1799. The Smithsonian acquired this object in 1961. References: Colin Barnes, "The Customs and Excise Gauging Slide Rule," Journal of the Oughtred Society 4, no. 2 (1995): 53–57; Ron Manley, "Gauging," http://www.sliderules.info/a-to-z/gauging.htm; Gloria Clifton, Directory of British Scientific Instrument Makers (London: National Maritime Museum, 1995), 167. This is a two-foot, two-fold boxwood rule with a brass hinge and endpieces. Half of one side is a slide rule with A and D scales on the base and B and C scales on the slide. As with MA.306697.01, the C scale is the same as the A and B scales (the square of the D scale), instead of the same as the D scale, as on modern Mannheim slide rules. Below the D scale is marked: SQUARE CYLINDER GLOBE (3 times) ROUTLEDGE'S ENGINEER. The first three marks form headings for the tables on the other half of this side when the instrument is folded. The tables give conversion factors from the volumes of geometric solids to units of volume, in both the "old" and imperial systems; conversion factors from the volumes of geometric solids to the weights in pounds of various substances; the areas of polygons from 5 to 12 sides; the gauge points of a circle; and gauge points for pumping engines, to find the diameters of steam cylinders that will work pumps of specified diameter at 7 pounds per square inch. The other side has a scale of 24 inches along one edge, divided to sixteenths of an inch for 9 inches and to eighths of an inch for the rest of the scale. There are also scales for making scale drawings that are 1, 3/4, 1/2, and 1/4 inches to the foot. This side is marked: T. ASTON THE ORIGINAL MAKER WARRANTED. One outside edge has scales for 10 and 12 parts to the inch; the other outside edge divides one foot into 100 parts. This form of slide rule was invented by Joshua Routledge, a seller of iron goods, in 1808 or 1809. He discussed it in the 1813 (4th) edition of Instructions for the Engineer's Improved Sliding Rule. According to Gloria Clifton, there were two rule makers named Thomas Aston, presumably a father and son, who were in business at various addresses in Birmingham, England, from 1818 to 1862. The references to pre-imperial system units of measure suggest the rule might have been made shortly after the imperial system was adopted in 1824. This instrument was found in the home of Grace Speer, granddaughter of Alfred Speer (1823–1910), an inventor and wine merchant in Passaic, N.J.
References: John V. Knott, "Joshua Routledge 177–1829," Journal of the Oughtred Society 4, no. 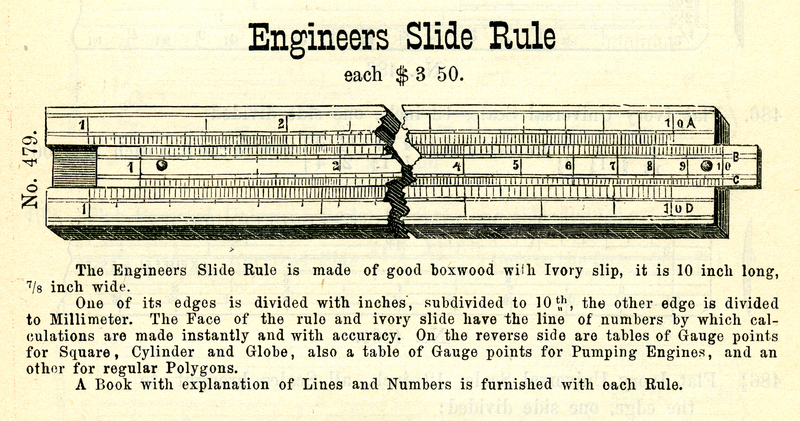 2 (1995): 25; Philip E. Stanley, "Carpenters' and Engineers' Slide Rules: Routledges' Rule," Chronicle of the Early American Industries Association 37, no. 2 (1984): 25–27; Gloria Clifton, Directory of British Scientific Instrument Makers (London: National Maritime Museum, 1995), 11–12; accession file. This is a twelve-inch, four-sided boxwood slide rule used in England for measuring and taxing barrels of liquid. Each of the four slides has a brass guide at one end, and the various special points on the rules are marked with inset brass pegs. On one side, the base has a D scale, logarithmically divided from 1 to 3.2 and from 3.2 to 10. Point 18.789 is marked G, the circular gauge point, for determining the mean diameter of a barrel. Point 46.3 is marked MS, for the side of a square vessel that contains a solid bushel per inch of depth, and point 52.32 is marked MR, for the side of a square vessel that contains a malt bushel per inch of depth. The slide has two identical B scales, logarithmically divided from 1 to 10. Point 277.42 is marked G for the imperial gallon. On the second side, the base has logarithmic scales that run from 1 to 8 and from 8 to 100. It is labeled SEGT ST (Segments Standing) at the top left and SS at the bottom right. The slide has two identical C scales, logarithmically divided from 1 to 9. This side was used to estimate the volume of a barrel that was standing vertically and partially filled. The back of the slide lists gauge points, divisors, and factors for circles for malt and for gall (another substance used in making alcoholic beverages) in circular and square containers. On the third side, the base has an A scale, logarithmically divided from 1 to 10, and an MD (Malt Depth) scale that runs logarithmically in the opposite direction from somewhat less than 3 to 20. Point 2219 is marked B, for the number of cubic inches in a bushel under the imperial system of measurement, and point 277.42 is marked G, for the imperial gallon. The slide has two identical C scales, logarithmically divided from 1 to 9. The back of the slide has a scale of inches, a scale labeled SPH[EROI]D, and a scale labeled 2D VAR[IETY]. These scales are for determining the diameters of two different shapes of barrels. Underneath the slide is marked: COOK. MAKER TO THE HONBLE BOARD OF EXCISE. LATE WELLINGTON CROWN COURT SOHO LONDON NO 2950. On the fourth side, the base has logarithmic scales that run from 0 to 4 and from 4 to 100. It is labeled SEGT LY (Segments Lying) at the top left and SL at the bottom right. The slide has two identical B scales, logarithmically divided from 1 to 9. Underneath the slide, points 3.9 and 99 are connected by a line marked with H.
The use of the Imperial system of units dates this slide rule to after 1824. It is of the style developed by Thomas Everard in 1683 and, at 12 inches, represents one of the two standard "pocket" sizes (the other was 9"). Laban Cook(e) succeeded Alexander Wellington (d. 1825) as a Maker to the English Board of Excise and remained in business until 1834. Compare to the older rule for gauging and ullage (the amount a container is lacking to be full), 319510. References: D. Baxandall, Catalogue of the Collections in the Science Museum: Mathematics I. Calculating Machines and Instruments (London, 1926), 42; Colin Barnes, "The Customs and Excise Gauging Slide Rule," Journal of the Oughtred Society 4, no. 2 (1995): 53–57; Peter M. Hopp, Slide Rules: Their History, Models, and Makers (Mendham, N.J.: Astragal Press, 1999), 72, 245; Gloria Clifton, Dictionary of British Scientific Instrument Makers (London: National Maritime Museum, 1995), 64. From the late 18th to the mid-19th centuries, British engineers began to use slide rules. This ivory and silver instrument is a four-fold engineer's rule that unfolds to a length of 24 inches. On half of one side is a slide rule with A and D scales on the base and B and C scales on the slide. The A and D scales seem to run continuously, although the slide only moves on the second six inches of the rule. The words IRON and ROPE appear several times along the edge of the A scale. Along the edge of the D scale is marked: DESCRIPTION SQUARE CYL[I]ND[ER] GLOBE SQUARE CYL[I]ND[ER] WEIGHT STRAIN WORK INCLIN[E] POLYGON SIDE GOVERNORS H[ORSE]P[OWER] ENGIN[E]S STE[A]M TEM[PERATURE]. When the rule is folded, these markings correspond to the tables on the other half of the instrument. The other half of this side has a table of gauge points for the A scale. Instructions printed on the rule suggest that calculations on the slide rule were intended to be made with calipers. Additional tables and instructions for working with ropes and chains are on this half, which is marked: IMPROVED & ARRANG[E]D (/) BY RT HAWTHORN (/) CIVIL ENGINEER (/) NEWCASTLE TYNE. The other side has a scale of 24 inches divided to eighths of an inch along the edge. The metal joint has a protractor divided in increments of 5 degrees and marked by tens from 0 to 180. When the instrument is folded around the joint, there are tables for the extreme strain possible in bars and beams of various substances and for equivalent measures. The joint is marked: G. R. STEPHENSON (/) ENGINEER (/) Adam Pensom. In 1832 civil engineer Robert Hawthorn (1796–1867) designed a new form of slide rule for manufacturing locomotives and other engines. In 1859 dealers sold the rule for 5 shillings and 6 pence. The names on the joint may refer to the British civil engineer George Robert Stephenson (1819–1905), nephew to the engineer George Stephenson (1781–1848), who sought mechanical advice from Hawthorn's father, and to Adam Pensom (b. 1824), who was a retired gas engineer living in London, according to the 1881 British census. The Smithsonian acquired this object in 1973. References: Robert Hawthorn, Instructions for the Use of the Mechanics' Sliding Rule (Newcastle-upon-Tyne, 1841), available online at http://www.physics.uq.edu.au/physics_museum/hawthorne/; "Mr. Robert Hawthorn," Minutes of the Proceedings of the Institution of Civil Engineers 27 (1867–1868): 590–592; advertisement by John Archbutt, The Mechanics' Magazine, n.s., 1, no. 10 (March 4, 1859): 486; Peter M. Hopp, Joint Slide Rules (Jeremy Mills Publishing: Lindley, Huddersfield, West Yorkshire, 2009). One of the first types of slide rules sold and made in the United States was the carpenter's rule, used for calculations relating to timber, which was one of the country's major early exports. This rule is marked on the lower arm: S. A. JONES & CO. (/) HARTFORD–CON. (/) WARRANTED BOX WOOD. Solomon A. Jones made carpentry tools in Hartford, Conn., from 1838 to 1841. Compare to 1987.0771.01, a British carpenter's rule of the same period. The collections include an image of someone holding the rule (see 2003.0215.02). This boxwood carpenter’s rule has a brass joint, metal caps at the ends of the arms, and a brass slide. The front of the slide has two identical logarithmic scales labeled B and C. Above is an identical logarithmic scale on the arm; this scale is labeled A. All three of these scales have a double cycle of logarithms, like the A and B scales on a Mannheim rule. Below the C scale on the arm is a scale labeled D and also GIRT LINE, which is divided logarithmically and runs from 4 to 40 (in other words, this is not the D or principal scale of Mannheim slide rules). The girt line can be used with other scales to estimate the volume of timber available from a log. Underneath the slide is imprinted the number 33. The back of the slide is also stamped with the number 33 and is somewhat crudely marked with a twelve-inch ruler, divided to eighths of an inch. The lower arm contains scales for making scale drawings that are 1/4, 1/2, 3/4, and 1 inch to the foot. The units on the 1/4-inch chain scale appear to be numbered erroneously after 18 (e.g., the next numbered division after 18 is 10 rather than 20). Along the edge is another twelve-inch scale, divided to eighths of an inch. The other side of the rule has a scale of 24 inches along one edge, divided to sixteenths of an inch. One arm has a scale labeled by twos from 34 to zero and is marked M. A number for 31 is between 32 and 30, and the number for 6 is omitted. The other arm has a scale marked E and labeled by twos from 24 to zero. The number 24 appears twice, and 6 is omitted. The M and E scales were used in cutting polygonal sections of wood. The outside edge has two scales, each dividing one foot into 100 parts. References: Kenneth D. Roberts, Introduction to Rule Collecting (Hartford, Conn.: The Bond Press, Inc., 1982); "Solomon A. Jones & Co.," The Davistown Museum, http://www.davistownmuseum.org/bioSAJones.html. S. A. Jones & Co. In the 17th century, the British author Henry Coggeshall published a pamphlet describing a linear rule especially for calculations relating to timber. As one of the major early exports of the British colonies in North America and later the United States was timber, it is not surprising that a form of Coggeshall’s rule, called the carpenter’s rule, came to be one of the first slide rules used and sold in this country. The carpenter’s rule was made from two wooden one-foot rules that were held together at one end by a metal joint. Unfolded, one side became a simple two-foot measuring rule. The upper part of the other side contained a groove that held a brass slide, with logarithmic scales on the upper and lower edges of both the slide and the adjacent parts of the groove. The outer edges and lower part of this side commonly were marked with other scales of use to carpenters and spar-makers. This boxwood carpenter’s rule has a brass joint, a brass cap at the end of one arm, and a brass slide. The cap and part of the wood have worn away at the end of the upper arm, which has the slider. The slide has two identical logarithmic scales labeled B and C. Above it is an identical logarithmic scale on the arm; this scale is labeled A. All three of these scales have a double cycle of logarithms. Below the C scale on the arm is a scale labeled D and also GIRT LINE, which is divided logarithmically and runs from 4 to 40 (in other words, this is not the D or principal scale of modern Mannheim slide rules). The girt line can be used in conjunction with other scales to estimate the volume of timber available from a log. The rule is marked: T. BRADBURN & SON MAKERS WARRANTED BEST BOX. The lower arm contains scales for making scale drawings that are 1/4, 3/8, 1/2, 5/8, 3/4, and 1 inch to the foot. The other side has a scale of 24 inches along one edge, divided to sixteenths of an inch for 6 inches and to eighths of an inch for the rest of the scale. One arm has a scale numbered by twos from 46 to zero and labeled SQUARE LINE M. The other arm has a scale labeled by twos from 36 to zero and marked E. The M and E scales were used while cutting polygonal sections of wood. The outside edge has two scales, each dividing one foot into 100 parts. All of the scales are crudely divided. According to Gloria Clifton, George Thomas Bradburn made rules in Birmingham, England, from 1841 to 1852. According to W. L.Goodman, Thomas Bradburn was in business making rules in Birmingham from 1839 to 1870. Thomas Bradburn & Son was in business in Birmingham from 1863 to 1876. Hence, this carpenter’s rule would seem to date from the period 1863–1876. This instrument resembles a carpenter’s rule sold in the United States by S. A. Jones & Co. of Hartford, Conn. (2003.0216.01). References: Gloria Clifton, Directory of British Scientific Instrument Makers, 1550–1851 (London: National Maritime Museum, 1995), 36; W. L. Goodman, British Planemakers from 1700 (Mendham, N.J.: Astragal Press, 1993), 185–186; Bruce Babcock, "A Guided Tour of an 18th-Century Carpenter's Rule," Journal of the Oughtred Society 3, no. 1 (1994): 26–34. This yew rule has straight brass ends and two slides, which fit between the three parts of the base. On one side, the top scale on the base (labeled A), the two scales on the upper slide (labeled E), the first scale in the middle of the base (labeled D), and the two scales on the second scale (labeled B and C) are identical logarithmic scales that run from 1 to 10 twice in the length of the rule. The second scale in the middle runs from 1 to 100 and is labeled SEGT ST (segments standing). The lowest scale on the base is labeled SEGT LY (segments lying). These scales are used with the slides to find the volume of the liquid in a cask that is not full, either when it is standing on its base or lying horizontally. The ImB and ImG points, for just over 2200 cubic inches in an imperial bushel and 277.42 cubic inches in an imperial gallon, are marked on the A scale. On the D scale, point 18.95 is marked IG for the diameter of a cylinder containing one imperial gallon; point 46.3 is marked MS, for the side of a square vessel that contains one solid bushel per inch of depth; and point 52.32 is marked MR, for the side of a square vessel that contains one malt bushel per inch of depth. The reverse side of the rule has a scale on the base labeled A that runs logarithmically from 1 to 10. Both slides have identical scales (the one on the upper slide is labeled C) that run from over 80 (UNDER PROOF) down to 0 (PROOF) and then up to 70 (OVER PROOF). The middle of the base has a scale labeled B that runs logarithmically from 4 to 40 and a scale labeled C that runs logarithmically from 300 to 30. The bottom of the base has a scale, also labeled C, that runs logarithmically from 100 to 10. There is no indicator. One edge of the instrument has a scale labeled SPHD and a scale labeled 2ND VARIETY. These scales are for determining the diameters of two different shapes of barrels. The other edge is marked: L. LUMLEY & CO LTD 1 AMERICA SQUARE LONDON. L. Lumley & Company, a distributor of packing cases and related materials for bottling, was in business in London from at least 1884 though 1929. For slide rules with similar two-slide designs but different purposes, see MA.318478 and 1987.0693.01. For earlier gauger's rules, see MA.319510 and 1980.0588.04. Reference: Ronald E. Manley, "Gauging," http://www.sliderules.info/a-to-z/gauging.htm. This eight-inch wooden Mannheim linear slide rule is coated with white celluloid and has a brass indicator in the single chisel style. It has no endpieces. The top edge is beveled and has a scale of 20 centimeters, divided to millimeters. A 20-centimeter scale, divided to millimeters, is on the front edge. A third 20-centimeter scale under the slide is numbered from 22 to 41. The top of the base has a scale divided logarithmically from 1 to 10 twice. The bottom of the base has a scale divided logarithmically from 1 to 10. These are the usual A and D scales, although they are not lettered. One side of the slide has the same two scales (the usual B and C scales, although they are not lettered). The other side of the slide has a scale of tangents that runs from 0 to 45 degrees and is lettered T; a scale of equal parts that runs from 0 to 10 and divides every two centimeters into 50 increments; and a scale of sines that runs from 70 to 0 and is lettered S. Compare to MA.318474. There is a place on the back of the instrument for a table of physical constants, but there is no table. The top of the base is marked: TAVERNIER-GRAVET. The bottom of the base is marked: RUE MAYET 19.PARIS. It is also marked there: KEUFFEL & ESSER Co NEW-YORK & CHICAGO. The back is marked: MÉDAILLES D'OR 1878 ET 1889. The British engineer's rule was brought to France by Edme-François Jomard in 1815, and by around 1820 Paul-Etienne Lenoir was manufacturing them in Paris. Lenoir's firm was succeeded by Gravet-Lenoir and later Tavernier-Gravet. From about 1851, Tavernier-Gravet manufactured a slide rule on the design of Amédéé Mannheim; this is such a slide rule. It was made after Tavernier-Gravet was awarded gold medals at world's fairs held in Paris in 1878 and 1889. Before Keuffel & Esser manufactured its own rules around the turn of the 20th century, the company sold slide rules from Tavernier-Gravet and from Dennert & Pape of Germany. (Additional company history is provided with MA.318477, MA.318478, and MA.326613.) Although the scales and indicator resemble the ten-inch model 479–2 (subsequently numbered 1746N and 1746), a rule of this length (scales about 8" long) is not listed in K&E catalogs. The ten-inch version with brass indicator cost $4.50 between 1883 and 1890. In 1892 the single-chisel indicator was replaced with a double-chisel indicator. References: Florian Cajori, A History of the Logarithmic Slide Rule and Allied Instruments (New York: Engineering News Publishing Company, 1909), 55–58, 80–81; M. Jomard, "The Slide Rule in France—1815," trans. Francis Wells, Journal of the Oughtred Society 8, no. 2 (1999): 11–16; Catalogue of Keuffel & Esser, 17th ed. (New York, 1883), 93; Catalogue of Keuffel & Esser, 20th ed. (New York, 1887), 129; Catalogue of Keuffel & Esser, (New York, 1890), 131.